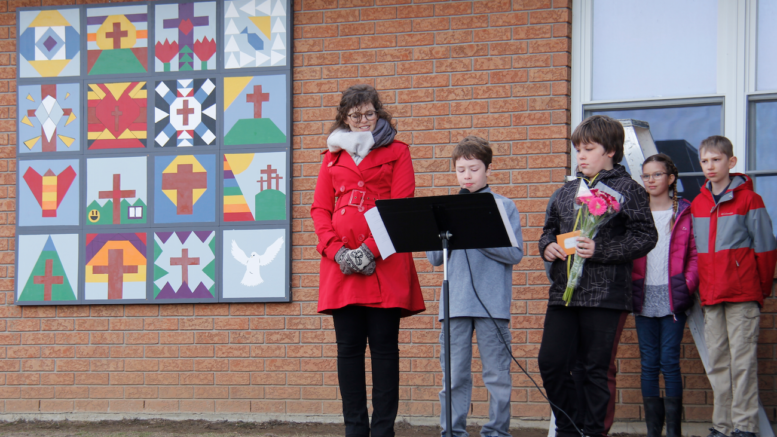 Sonrise Christian Academy is the latest stop on the Prince Edward County Barn Quilt trail thanks to a new piece of collaborative art created by Jessica Carney-Hoornweg’s Grade 4/5 class. Barn Quilt Trail organizers and students gathered at the local Christian elementary school on Thursday morning for an official unveiling. Pat Dubyk, coordinator of PEC Barn Quilt Society and Trish Hornsby, a fellow barn quilter assisted the class in the creation of the Sonrise quilt and were thrilled with the outcome. Dubyk visited the class on a weekly basis and gave her time and skills to help each and every one of the students produce their best work, walking them through the process step-by-step and always with an encouraging word and patience. The class thanked Dubyk for her encouragement and expertise and students told her the Sonrise barn quilt would not have been possible without her efforts. A total of 16 individual pieces of art make up the entire panel with many crosses exemplifying Sonrise’s strong Christ-centred, friendly and loving community. Brown serves as a symbol of earth and the foundation from which all things grow while Christ is the life giver and students grow in him. “We were made from the ground when god first created man and this also means that we believe we are stewards of his creation. Blue represents how we are protected by God and we strive to work at peace with one another in our world. Green embodies the image of growing academically and in relationship with the lord. Teachers help us to grow in all these areas. White symbolizes the values we put into taking care of our bodies and being active through out the day. Furthermore, it reminds us that we are clean in the eyes of God, white as snow, we love God because he first loved us, we learn to love everyone in our community. All these colours and symbols reflects Gods character, his beautiful creation and our hearts desire to be like him,” the students said during the presentation. 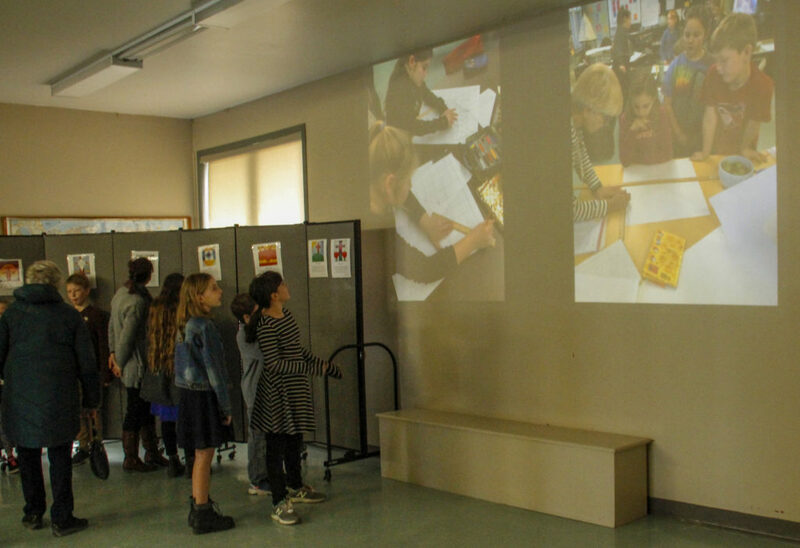 During the summer months the school chose which arts unit to utilize biblical story telling and have been integrating those decisions throughout the school year. Hornsby had been another faithful helper who came to assist students with taping, painting and touchups on their barn quilt and the students thanked her and a number of volunteers as well as Flawless Framers who assisted in the creation and installation of the barn quilt. Dubyk compared this barn quilt installation with others and mentioned it was unique given the bright and inquisitive young minds involved.